EP 27: Sophia’s one way ticket is to a place many of us hope to visit. Sophia Brittan graduated from Georgetown University in 2005, after which she moved to New York City in pursuit of a culinary education. She graduated from the French Culinary Institute in 2006, followed by the Institute of Integrative Nutrition. In 2007, Sophia founded KitchenCaravan.com, a healthy online cooking show, where she developed recipes and hosted the program. 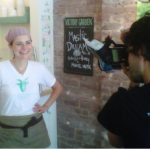 Four years later, she opened Victory Garden, where she serves goat milk soft serve ice cream made with local ingredients and an exotic flair. Sophia’s love of cooking, strong belief in healthy eating, and passion for travel, have all shaped Victory Garden into a place that blends local and foreign cultures.